The Mazda CX-3 is what happens when you combine a Mazda MX-5 and a compact SUV – so it’s the sporty choice, and we think that it’s also one of the best looking cars you can buy. Today there’s a wide choice of powertrains, from electric to downsized turbo petrol engines. 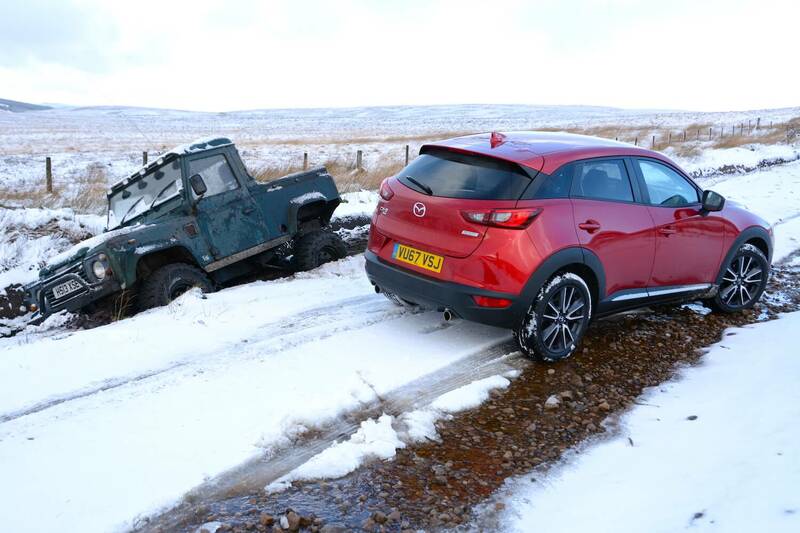 However Mazda is proud to stick to optimising ‘conventional’ technologies. 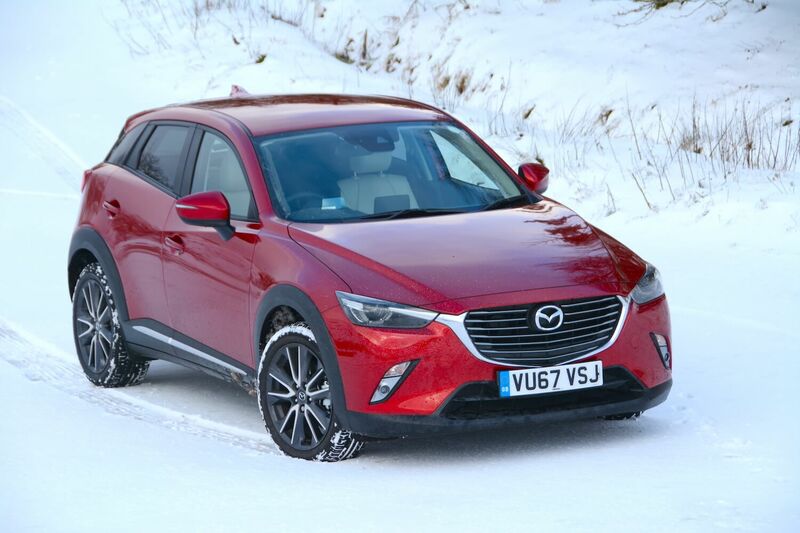 This means that our CX-3 has a 2-litre petrol engine with no turbo – can this really be a ‘green’ choice? And how did the CX-3 perform in snow in the Peak District? Let’s start with design, and a statement that we’re sure about, but that may provoke some controversy. 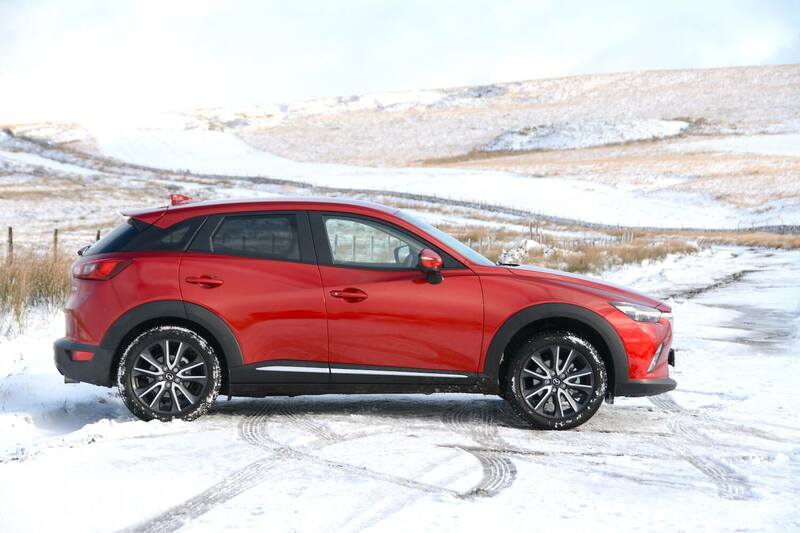 We think that the Mazda CX-3 is one of the best-looking cars that you can buy. It has simple, elegant, uncluttered exterior design, and the same can be said of the interior. In the face of many cars with fussy design details, the CX-3 is a breath of fresh air. It’s also a practical body shape, and there’s a deep boot if you remove the false boot floor. There’s a 4-cylinder, 2-litre petrol engine in our test car – and highly unusually today, there’s no turbo. There’s also a 6-speed manual gearbox, and our test car had all-wheel drive. The Mazda CX-3 is what happens if you cross an MX-5 with a compact SUV. The CX-3 shares many of the same genes as the MX-5 – the sporty, direct, tight driving experience, the slick gearbox, and the naturally-aspirated 2-litre petrol engine. 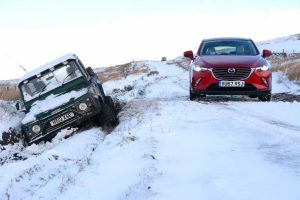 The same comment applies to the ride and handling – unlike many compact SUVs, the ride is firm rather than soft, which is likely to appeal to keen drivers rather than drivers who spend most of their time on poorly-surfaced urban roads. The CX-3 also isn’t as refined as some rivals, and this comment includes motorway driving, when there’s more engine and wind noise than there should be. The naturally-aspirated engine results in linear acceleration, which lacks the instant response of a turbo, and is likely to feel old-fashioned to many people compared to most turbo engines. There’s also no choice of drive mode settings. This CX-3 had all-wheel drive, which gives improved levels of grip on wet roads. But how did it perform in snow in the Peak District? 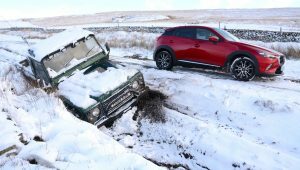 It had standard road tyres rather than any form of all-season or winter tyres, but it still managed to muster sufficient traction to get going at all times in a snowy Peak District, and it even made it safely past a Land Rover in a ditch without succumbing to the same fate. 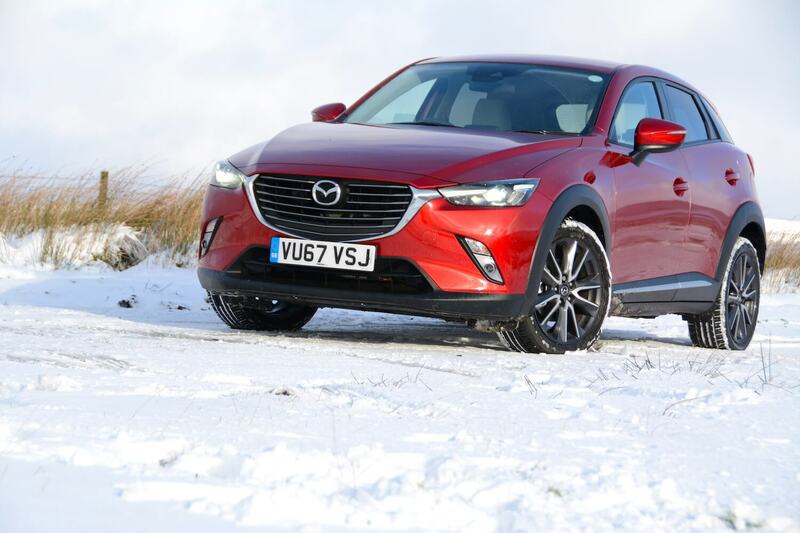 During this test, the CX-3’s heated seats and heated steering wheel proved very useful. Other interior highlights include the infomedia system, which has many similarities with BMW’s iDrive system, which is a good thing; there’s a rotary controller along with set of shortcut menu buttons between the two front seats, so you don’t have to attempt to press small buttons on the touchscreen at high speeds on bumpy roads, which is a massive bonus compared to cars where all the controls are on the touchscreen. Thankfully, the heating controls are also separate from the touchscreen. Another good point about recent Mazdas that we’ve driven is that the very annoying lane departure warning feature – which beeps at you when you drive anywhere near a white line – can be switched off, and it stays switched off for good. Unfortunately something has gone horribly wrong, and in the CX-3 you had to switch off this button every time you got in the car – a definite backward step. If you reach down to the right-hand button on the bottom right hand side of the dashboard to switch off this feature, you’ll end up switching off the traction control system – so ending up in a potentially more dangerous situation than you would be in if you didn’t have a lane departure warning system. Another issue is that when you walk away from the car with the keys in your pocket it automatically locks itself. Not great when you have young children in the car, who then become locked in. The official combined NEDC fuel economy figure for the Mazda CX-3 2.0 150PS AWD Sport Nav is 44.1mpg – equating to 150 g/km CO2. You may be thinking that this doesn’t sound particularly ‘green’. Well, compared to an electric car with 0 g/km CO2 tailpipe emissions, it isn’t, but this is a sporty, all-wheel drive petrol SUV, so an official economy figure of 44.1mpg isn’t too bad. But the key issue is that engines such as downsized turbo petrol units may perform well in the NEDC test lab, but they perform terribly when driven out of this low load cycle. In comparison, we believed that there wouldn’t be as much of a gap between the official figure and the real-life figure with the CX-3. So how did it perform? It achieved 45.3mpg at 70 mph on the motorway (so beating the official combined NEDC figure), and it achieved 45.9mpg on A and B roads (so beating the official combined NEDC figure). Overall after a week of mixed driving – including snowy hills and urban areas – the CX-3 averaged 40.4mpg. This is less than the official combined figure, but is much closer to it than any other car that we’ve tested recently, suggesting that our theory about better real-life mpg from non-turbo petrol engines is correct. 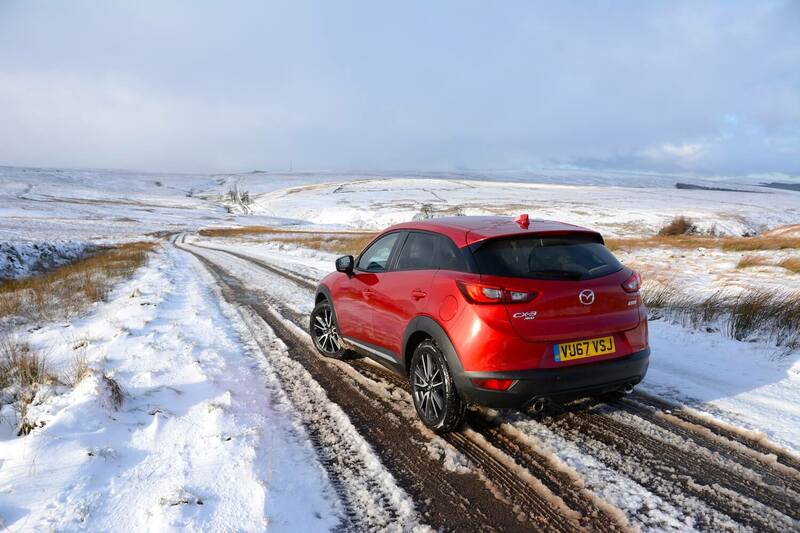 The Mazda CX-3 2.0 150PS AWD Sport Nav costs £22,895. 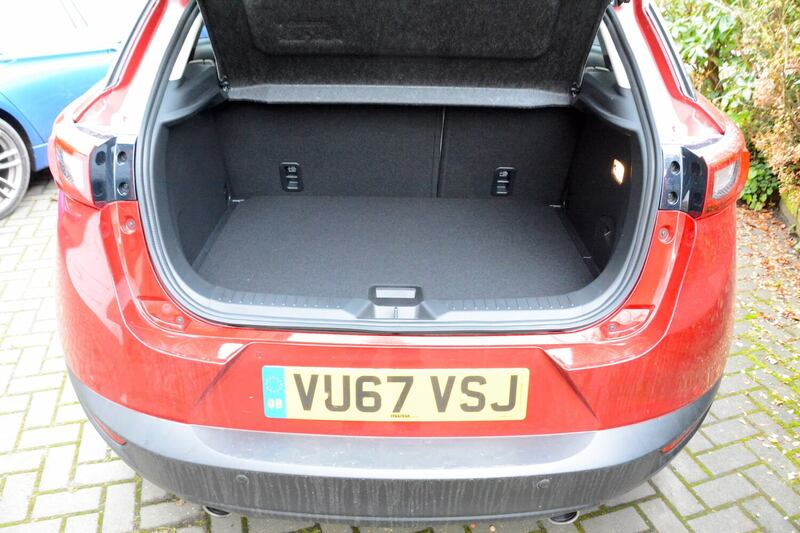 Our test car had options of Soul Red metallic paint (£670) and half stone leather (£1000), taking the total price of our car to £24,565. There are four trim levels: SE Nav, SE-L Nav, Sport Nav and GT Sport. There’s a 120PS or 150PS petrol engine, and a 105PS diesel. You can choose between manual or automatic transmission, and 2WD or AWD. Our final review of 2017, complete with festive snow, may have an unexpected conclusion. We think the Mazda CX-3 is one of the best looking cars you can buy, and one of the sportiest compact SUVs available, and our test has proven that the gap between the NEDC economy figure and the real-life economy figure for a non-turbo petrol engine is less than that for the turbo engines that we test. 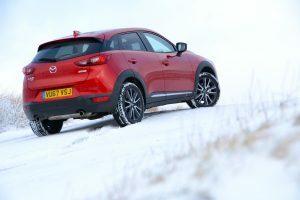 There’s also a diesel engine option for people covering higher mileages on motorways, which will deliver higher fuel economy and lower CO2 emissions (Mazda has held off developing electric powertrains so far, but that will have to change). 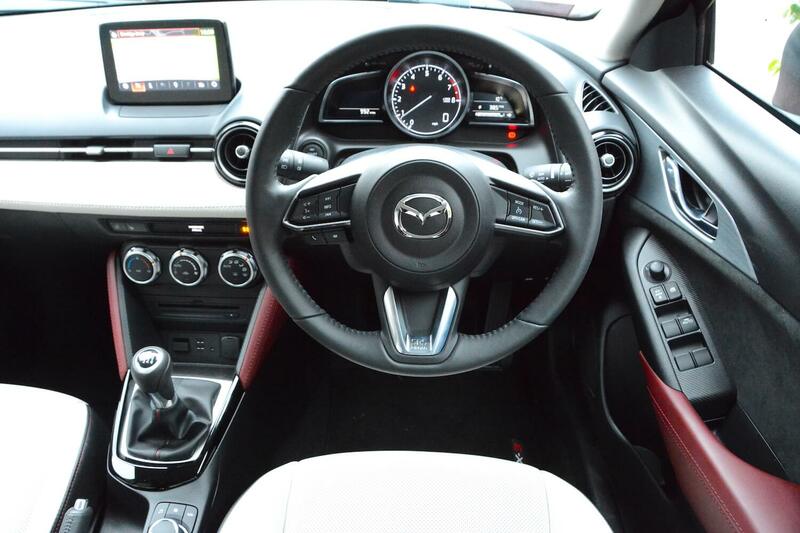 The CX-3 is also a practical size, and the interior is functional as well as aesthetically pleasing. 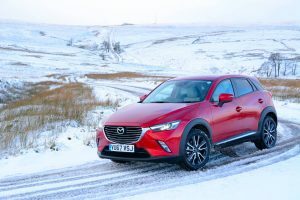 The Mazda CX-3 must be one of the most overlooked and under-rated cars on sale, and we’re pleased to award it a Green Car Guide rating of 9 out of 10.